Can you really get free satellite TV? Yes! If you're paying for satellite TV service, it may surprise you to learn that there's a free version, too. "Free to air" (FTA) satellite TV delivers thousands of channels of broadcast content via satellite to consumers all over the world. FTA signals are not encrypted; if you have the right receiving equipment, you can forget about subscription fees and decoders. And yes, it's legal. The producers of FTA free satellite TV content distribute their programming via satellite because it's the most efficient way to reach their audiences. It's quite similar to the free over-the-air television broadcasts that you can receive with a TV antenna - just a different means of transmission. Typically, FTA broadcasters are government-sponsored public TV services, like PBS in the United States. They don't air commercials or charge subscription fees. But you can also find a wide variety of channels, including news, sports, religious and ethnic programming. Of course, you won't get MTV, ESPN, HBO, or any of the high-priced premium channels that are delivered only via encrypted satellite or cable TV signals. But there are plenty of broadcasts that you can get free of charge, from many sources that deliver FTA broadcasts via satellite. FTA satellite TV is a favorite among expatriates, who want to stay tuned to the channels of their home nations but don't want to pay for it. Are you looking for free access to popular TV shows or movies? A variety of online services and clever gadgets can bring news and entertainment to your home via the Internet, for free, or a lot less than a monthly satellite or cable TV subscription. See Free TV With Hulu and Can Roku Replace Cable TV Service? for details. What you need to receive FTA satellite TV content is pretty basic: a satellite dish, an FTA receiver box, and some coaxial cable running between dish, box, and your TV set. The dish needs to be compatible with the satellite at which you're going to point it; however, most satellites transmitting FTA signals are compatible with the basic DTV dish available online, or at many electronics stores. Popular makers of FTA satellite TV gear include Pansat, Coolsat, and Conaxsat. The receiver box will cost a couple of hundred dollars and up. Prices vary depending on the signal formats supported and various bells and whistles (Ethernet jack, wireless in-home signal transmission, etc.) 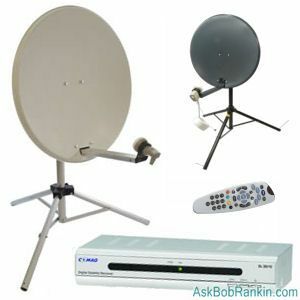 You can also buy FTA satellite TV kits which include dish, mounting hardware, coaxial cable or wireless transceivers - everything you need to get hooked up. Pointing a dish at the correct satellite is simple, in theory. But many people prefer to hire a contractor who specializes in satellite TV installations. A pro can put the dish on your roof safely and securely; orient the dish correctly to get the optimal signal reception; and run cables into and around your home neatly. See "satellite television installation" in your local phone book. What can you watch on FTA satellite TV? There are literally thousands of channels, and many Web sites devoted to keeping you informed of what's available. FTAList.com is just one such resource. Keep in mind that you'll be looking at channels from all over the world; many will be in Arabic, Japanese, and even more exotic languages. But the video portion of the broadcasts may be most important to you. FTA satellite TV is not for major league sports fanatics, people looking for the latest movies, or for anyone else who likes to follow the crowd. But if you want free satellite TV on a particular topic, or from a specific country, then you are in luck. For more helpful information, check out the FTA links and forums at the Satellite Guys website. You might have come here looking for information on how to get free satellite TV programming - the kind that usually requires a subscription from DirectTV, Dish Network or some other commercial satellite TV provider. I've written about the "Satellite TV on PC" scam -- software that promises to give you access to thousands of premium satellite TV stations on your PC for a one-time cost of $49. Don't fall for it. These "free satellite tv downloads" will NOT get you free MTV, VH1, or any other subscription satellite channels. Read my related article Free Satellite TV on PC for the whole story. You've also may have heard there are special satellite receivers you can use, along with 'FTA keys' that are downloaded from various and nefarious sources on the Internet, and that this will enable you to decode and view those encrypted premium channels. That might be true. But even if I had that kind of information, I'm not here to explain how to illegally pirate a satellite television signal. The little bit I've read on that topic leads me to believe that it's rather geeky, and requires a constant effort to stay one step ahead of both the satellite providers and law enforcement. I'd much rather pay my $30/month, sleep well at night, and not have to bother with loading a string of hexadecimal digits into my set top box before every show. Most recent comments on "HOWTO: Get Free Satellite TV"
I live in a travel trailer, with a winegarde 1000 automatic sat dish. its set up as a dish network dish. I have cancelled Dish networks. what do I need to do to the sat dish. and where do I get a good receiver, or perhaps a DVR? EDITOR'S NOTE: Not sure what you mean. If the dish is owned by Dish, I assume they'll want it back. labillyboy - what kind of antennas for $17. and what do you use them for? When I had my own house I had the largest antenna that Radio Shack has and put it in the attic (no antenna were allowed in that sub division) and got great programs - ABC - CBS etc and others.. I remember the early 90's with a directable 10 foot dish that picked up hundreds of channels on C-band. If you liked a channel, you could subscribe to JUST THAT CHANNEL (or any other you liked) for from $1 to $3 a YEAR and it was perfect reception and just what I thought subscription/pay TV should be... yes, pay for just the channels I want to watch instead of a "package". Since then I have never had cable but with my outdoor antenna here in Costa Rica, I get 35 local channels which is enough for me. Do you have to have a receiver for fta satellite? EDITOR'S NOTE: How else would you receive the signal? Does it matter what type of tv? Analogue or digital? Thanks for this Bob. Like another poster it's easy to forget OTA satellite reception. Back in the 1980s i built a 15' tower for my $1000 free OTA system. Much to my chagrin the tower didn't help alot. Then came the channel encryption. Bye, bye. And thanks to the poster (Jack Agnew) recommending UStvnow. I'll be investigating that service. I just got at&t bundle pkg. What do recommend I buy to get fta tv ? I have a Direct TV dish with nothing connected to it, is there a "box" I can buy to get cable channels (not just the local channels)? i have a direct tv dish. they don want it back so it is hanging on the side of house. can i use that dish to go fta satilite or will i have to change sonething on the dish. My receiving box # 7000 for sky Cruiser satellite channel is not working . Do you have a replacement? and some one to install it in Durham, NC? EDITOR'S NOTE: Do I? Nope. The company from which you purchased it would be a good place to start. This is for "Tracy Paul 25 Jun 2016". The " Box " you want to get cable channels through. Is generally provided for no charge from Direct TV. The sad thing is Their business model Hooks you in with a Low introductory Monthly cost. At the of one year the cost doubles and at the end of two years it doubles again. They also call and nag you to upgrade to Movie channels resulting in an even higher Monthly costs. "DirecTV NOW" , "Sling TV", "HULU", or "PlayStation's Vue ". They also cost ``$40 per month, but none of them require contacts and can be stopped at any time with start up and stopping charges. I have "DirecTV NOW" and a "ROKU" smart-streaming box and of all the Networks that pay for, most of them have their own streaming APP. What makes that important is my "DirecTV Now" account password affords me access to those Network APP archives eliminating the need for a DVR. When I had DirecTV Sat. I had four TV rooms and was paying ~~$200 a month for the same channels. Now, I don't have to manage DVR and only Pay ~~$80 dollars per month. I put an UHF-HD antenna in place of the Sat. dish and all the local TV Channels drive all four TV's and by selecting the INPUT or SOURCE buttons I can switch to the ROKU and all the streaming apps my ~~$40 provides me. Even though I have cable internet I don't subscribe To their cable TV. Their business model in very similar to Sat.TV's and constantly increases. I tried DSL through the phone company but they limit my location 1.5Mb/s and that speed can barely stream a movie a 2AM. I have read that some people with satellite reception can watch what goes on during commercial break of live TV broadcasts, such as network news, "Larry King Live," the Academy Awards, etc. Someone claimed they watched Larry King picking his nose during a commercial break, or a network anchor arguing with a producer, etc. Is this true? As we have all learned long ago, nothing is FREE. and chances of that ever happening is next to zero. No matter what you plan to do, it's going to cost you. NOTHIG IS FREE. The best is BCE Premium TV. We are using it for a long time. Over 100 Premium Sports Channels ( Sky Sports, BT Sport, Bein Sports, Fox Sports, NBCSN, TSN, ESPN, NBA, NFL Network, Euro Sports, Setanta Sports, ... ) only $15/month or $70/year. just search "BCE Premium TV" on Google you will find it easily.